A Jersey bank account held in the name of Nationalist Party leader Adrian Delia received £349,000 – close to half a million Euro – in the form of cheque and cash deposits over the period during which it was open, according to media reports on Sunday. The story dates back to the early 2000s, when, it has been alleged, Delia was involved, directly or indirectly, in the laundering of proceeds from a Soho prostitution racket. The allegations were first made by assassinated journalist Daphne Caruana Galizia in August 2017, right in the middle of the PN leadership race which Delia went on to win. Caruana Galizia had claimed that Delia’s account received £20,000 every month in rent for the Soho house located at 52 Greek Street, which was used as a brothel during this period. Delia has denied any impropriety or illegal behaviour, insisting he was simply acting as a legal advisor to third parties. In a press conference which Delia called yesterday evening after receiving questions from the Sunday Times of Malta, Delia said he was asking the Police Commissioner to investigate falsified signatures on documents in the Times’ possession. 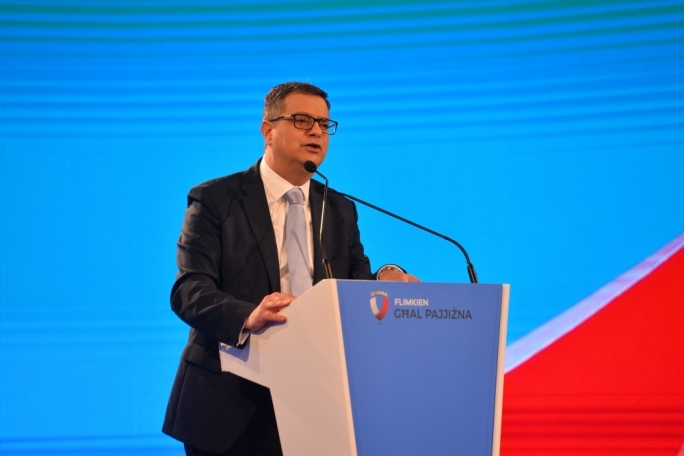 MaltaToday is informed that while Delia was giving his press conference, his lawyer Joe Giglio, met with Police Commissioner Lawrence Cutajar and Economic Crimes Unit head Ian Abdilla, and presented them with bank transfer documents claimed to contain falsified signatures. Police sources told MaltaToday that Delia had also met with the Commissioner following his press conference. According to the Sunday Times’ report, a 30-page FIAU report from an investigation prompted by Caruana Galizia’s claims concluded that there was sufficient information to conclude that Delia’s Jersey Bank account “may have been used for money laundering”. The report claims that the £349,000 in cash and cheques were deposited into the Jersey account at an Edgware Road bank along with other branches around London. While Caruana Galizia had claimed £20,000 were deposited into the Jersey account every month, investigators found that deposits varied from £400 to £16,000 per deposit. The high values transferred and the irregular nature of the deposits led investigators to the conclusion that they were not rent payments. The Times goes on to claim that funds from Delia’s Jersey accounts were subsequently transferred to two Swiss accounts, as well as to a Bank of Valletta account held by Healey Properties Ltd – a Bahamas company, the ultimate beneficial owner of which is unknown and which owned at least some of the properties known to have been used as brothels together with another company called AAS Freight Services. Documents seen by MaltaToday in 2017 included a board resolution show the company accepting the resignation as directors of both Delia and Economy Minister Chris Cardona. 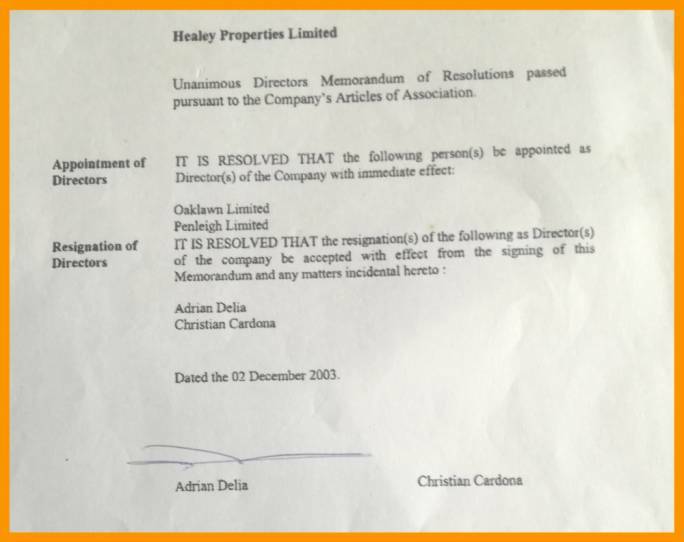 The document is dated 2 December 2003 and is signed by Delia only. 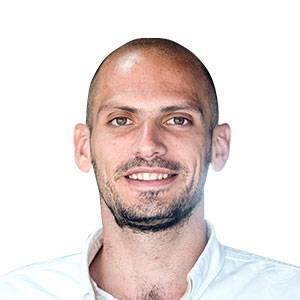 The two men were replaced as directors by two companies, one of which appears to be registered in the UK, and the second in the British Virgin Islands. Caruana Galizia had claimed that the Healey Properties and AAS Freight Services belonged to Eucharist Bajada, the brother of Emanuel Bajada, who, along with his wife Eve, was believed to have been tasked with collecting rent for the apartments. Evidence presented in Harrow Crown Court during proceedings against three women found guilty of being involved in a prostitution ring included a brown leather diary in which one of the women logged payments to a person identified as Eve. “11/4 Eve took rent for 6. I settled with bosses” and “14/4 £6000 need to give to Eve. With Muru there is £18000 + £6000 = £24000. Eve took,” read one of the diary entries. After 2004, the house was owned by Mark Barbara, an aide to minister Chris Cardona, who as lawyer had defended Emanuel Bajada on prostitution charges in 2005; and now it is owned by a BVI-registered company called Maybole.